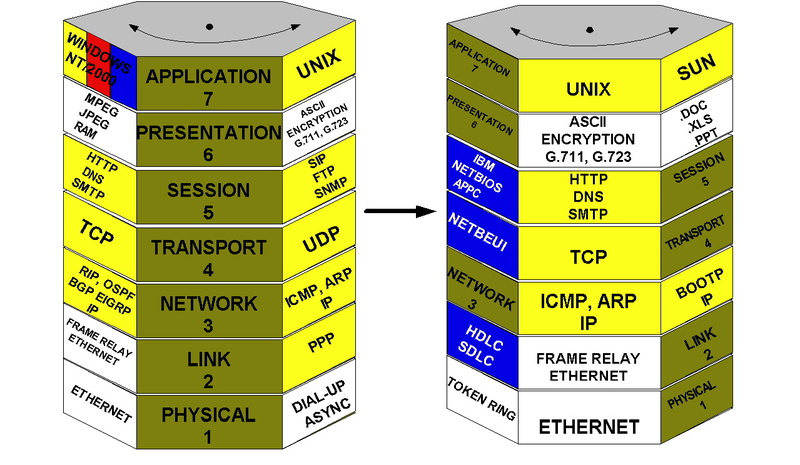 Your Friend In Understanding the 7 Layer OSI Model The OSIBuddytm was conceived to help explain the Open Systems Interconnect model that breaks down computer communication into functional blocks. These blocks are the basis of the OSIBuddytm construction. That said, it still is not an intuitive thing to try and describe the OSI model so I invented a toy that helps you learn this complex subject. Go ahead, spin the blocks and change out the layers just like the software programmers do so well at $150,000/year! Layers 1-7 are marked with their function and the associated protocols are labeled on each layer. The colors are only a reminder of what suite of protocols are associated. Yellow is for the TCP/IP family, Blue is for IBM's stack and Red is the Novell specific protocols. White blocks are non-protocol specific. This beats out the pneumonic Please-Do-Not-Throw-Sausage-Pizza-Away, to remember the 7 layers anyway.